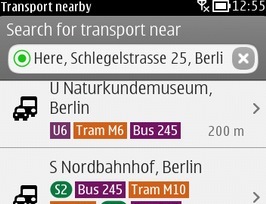 Nokia Public Transport helps you navigate cities by public transportation. This version is also available in Ovi Store. Please leave feedback here. It’s the best way to get in touch with us! All the platforms (S^1 and S^3-all firmwares) have now the same feature set – only difference is Transport Nearby on the map (which is only supported on Belle and newer firmwares). Transport Nearby in estimated routing areas. Improvements: battery live, start-up time, UI for Transport Nearby page, etc. What else is new in 2.1 for S^3 preAnna and Anna firmwares? Simple routing: Simple routing uses the map data to calculate a heuristic route, based on the likely frequency of lines. Improved experience in the available cities and increase to more cities; especially in China. What else is new in 2.1 new for S^1? 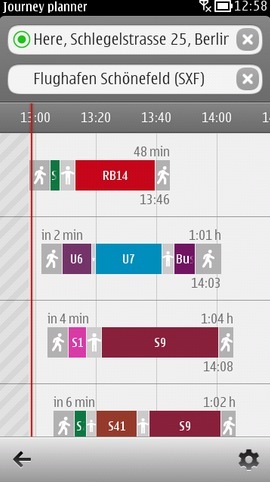 Much more coverage: many more timetable cities + simple routing (before only Berlin/Brandenburg). Transport Nearby: search for a station around a certain spot and get all the departures from that station. Line information: the stops along a line and its frequency. 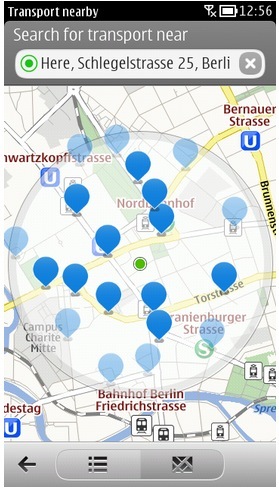 Integration of Nokia Maps: walk to or show your destination on the map using Nokia Maps. Coverage check: at the first time usage, a coverage check will show information about the supported coverage in the user‘s city. Besides, some legal information will also presented to the user. Cheers DeathMerchant for the tip!